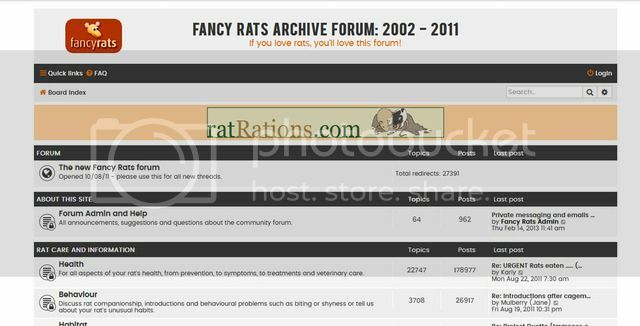 Old members will be able to log in and read their old messages, reminisce in the members only sections, as well as view the rat care sections which are accessible to everyone. Recent FR members - I highly recommend taking some time to browse through the old threads, and to use the search function to pull up threads on your chosen topic. Please note that it is a read only forum, excellent for reference, but any new threads belong on this board. If you wish to refer back to an old thread, just include the link. Whilst both boards will default to the standard blue style of layout, this one has the red/cream option, and we hope to offer a black/grey option on the archive very soon, to help you avoid any confusion over which one you are on. YAY! But also boo because I can't remember my old password and thus can't look at any of the old members stuff. I can set a new temporary password for you, and can do the same for anyone else that is stuck (although if there are a lot of requests it may take me a while!). I'll PM you when it's done. Thank you so much for this! Very useful for research. cyber ratty wrote: Whilst both boards will default to the standard blue style of layout, this one has the red/cream option, and we hope to offer a black/grey option on the archive very soon, to help you avoid any confusion over which one you are on. The archive option is shown below (incorporating colours from the original forum), so remember to change your board preference (user control panel) when you log in if you like it. It is also a mobile friendly format, so you can browse on the go! The archived forum was always such a good repository, well done !